When I start designing ceremony programs, I know I’m getting to go-time for the couple. Things are getting busy, decisions are being made and the stress level is probably a bit higher than when we were designing wedding invitations. That’s why I also show off ceremony programs at my invitation consultations. A couple may not be thinking about them, but when they need to, they probably just want to have them done. And that’s where I come in. 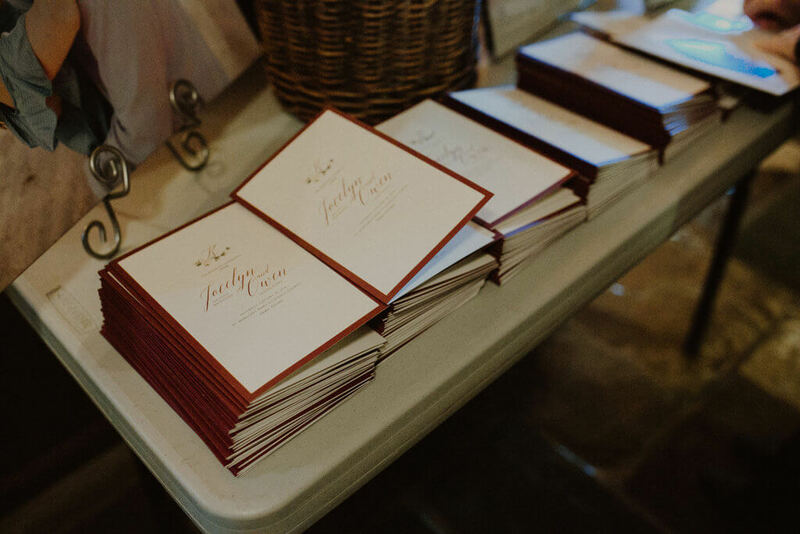 Most couples probably haven’t looked too closely at the ceremony programs they’ve had in their hands. They are good reading material during a wedding and that’s about it. 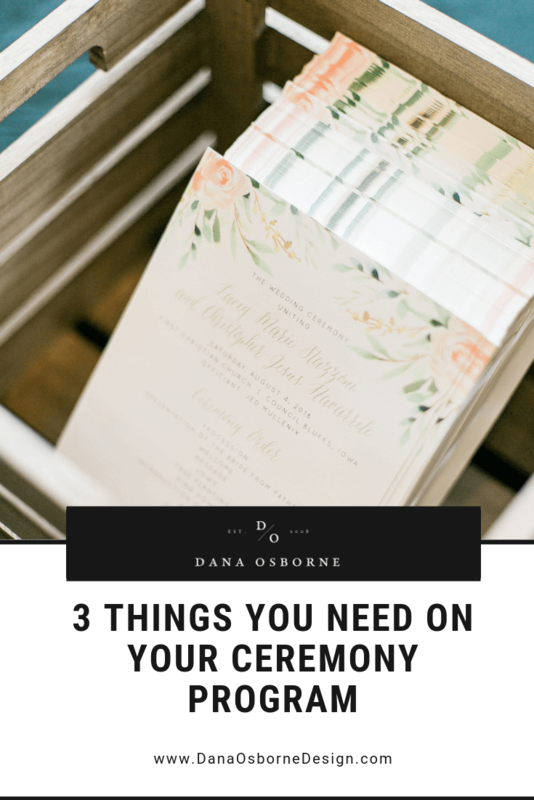 But there are some important pieces of information you need on a program, so that’s why I’m breaking it down to the Three Things You Need on Your Ceremony Programs. Think of this as the title of the program. This is your big moment and everyone who is grabbing one of these programs is there to see you. So your name should be on this piece! I like to put the wedding date of course as well as the location of the ceremony. Those elements just help mark the event in time and location. Another great tidbit to put in this section is the name of the officiant. This could also be under Wedding Party, but if space is tight, this is a great place to put them. 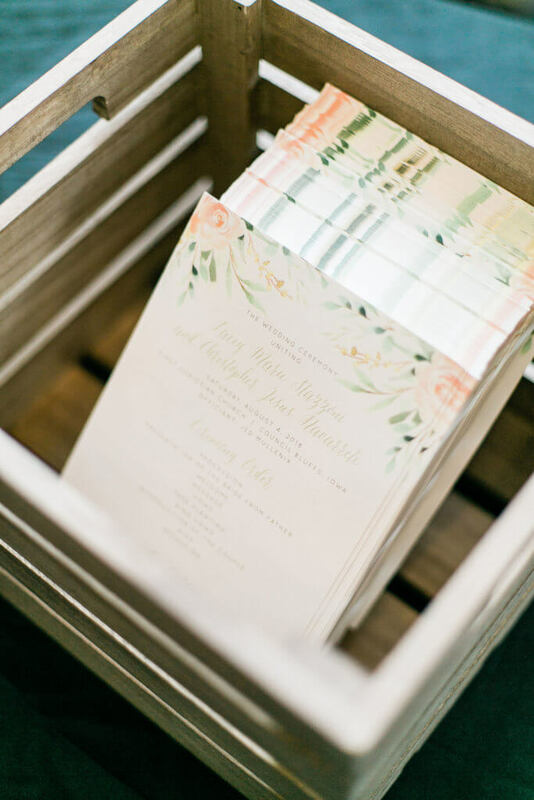 Your guests want to know what’s going to be happening in your ceremony. 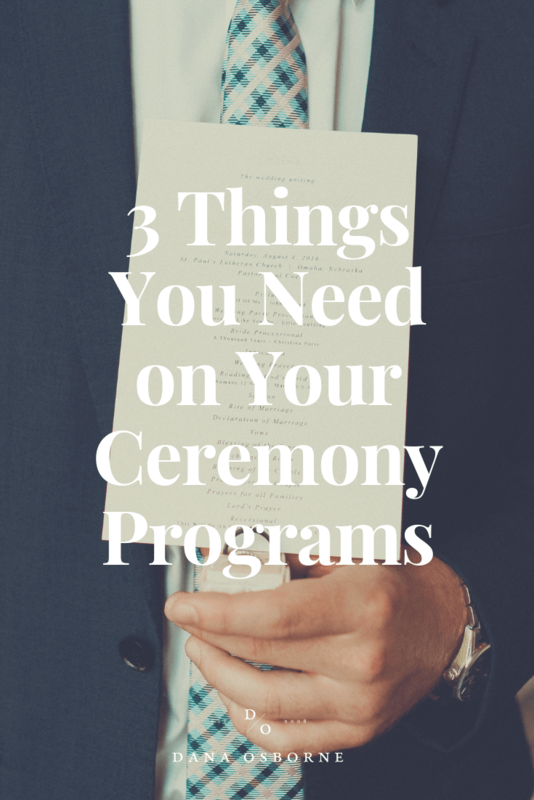 If that’s just a quick glance at each element or more in-depth info, like names of songs & readings, you’ll want to put something about the order of ceremony. If you’re non-traditional, you can keep it short and sweet and just list what is going to happen: Welcome, Reading, Music, Vows, etc. If you’re more traditional, think about the details. Many of my church weddings (especially those Catholic ceremonies) need certain elements listed such as names of songs, the composer, names of bible verses being read, who is reading them, etc. If you are getting married in a church, make sure to check if you need any certain elements listed in the order of ceremony. It’s time to give props to those people who are standing up for you. And that includes parents and grandparents. It’s a big day for them as well, so don’t forget to list them. If you’ve had a parent pass away, list them under parents as well. They are still your mom/dad, and putting the words “the late” in front of their name will tell people they are there in spirit. The people who are standing up with you that day, bridesmaids and groomsmen, are important to list as well. Think about if you want to list their role in your life too, i.e. Sister of the Bride. It’s optional but sometimes nice to have, as guests may wonder how you know who is up there. Other people to list could be flowergirls, ring bearers, ushers, personal attendants, musicians, etc. If you feel they have an important role that day, give them props here. 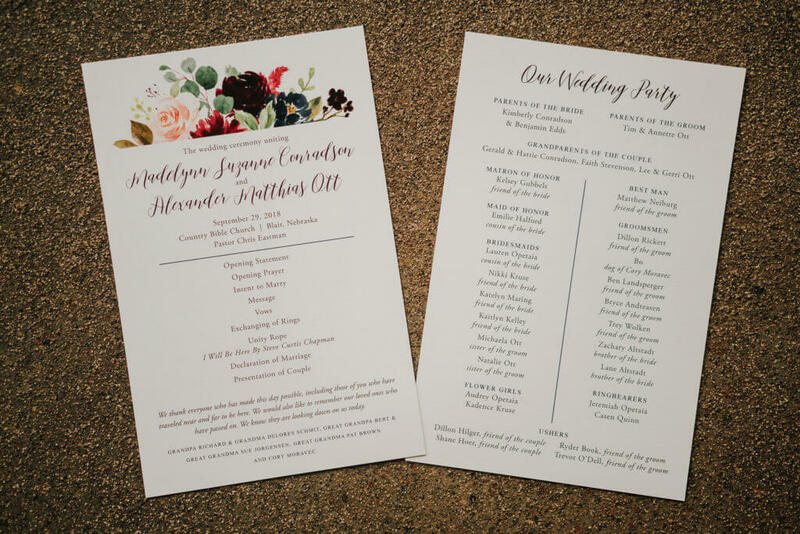 Other elements I see on programs are a “thank you” from the couple, an “in memory” section to remember loved ones who have passed, the couple’s new address and information about the reception, if there is one after the ceremony. Of course those who want to have a bit more fun can add anything! I’ve done timelines of the couples’ lives together, infographics about the couple and fun facts as well. 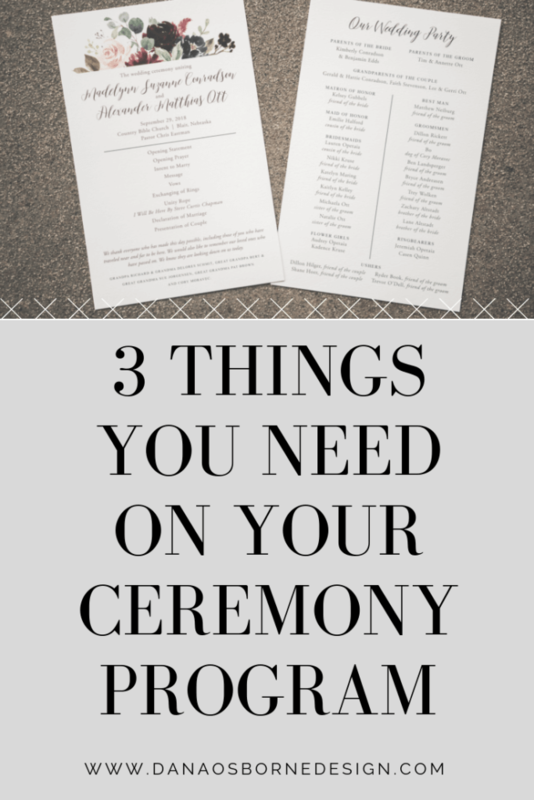 Ceremony programs are one of those final pieces, but one of my favorites too.